CCU breathed in the smell of peanuts and coconuts, their aromas tickling her tastebuds as she walked through the crowded streets. A merchant here, a food stall there, there was just too much! Well she had to start somewhere so she ambled over to an exotic location where the scent was especially strong. Allow me to introduce you to the wonderful, magical world of Thai food. Simple, exquisite and no pretentiousness, just classy, ambience. Dark oaks mixed with crimson as well as darker lighting set the mood inside but we sat outside with the sun waving goodbye. Perfectly set tables with a very innovative idea for a pre-packed hand sanitiser for your use either before or after your meal. Promoting hygiene before eating is such a big plus! In less than 5 minutes, I kid. You. Not. Our drinks had arrived. Firstly, my mum went for the very exotically displayed coconut juice, which she had been lusting after forever! Sweet and refreshing, I love the authenticity with which is arrived, all umbrellas-cocktail-style and rustic cut up coconut! My dad, never separated from his favourite Lemon Lime Bitters which was, as always, bittery sweet deliciousness in a glass! Me, I may look old enough to order cocktails, order a mocktail (parents… sheesh ;)) called Daiquiri. 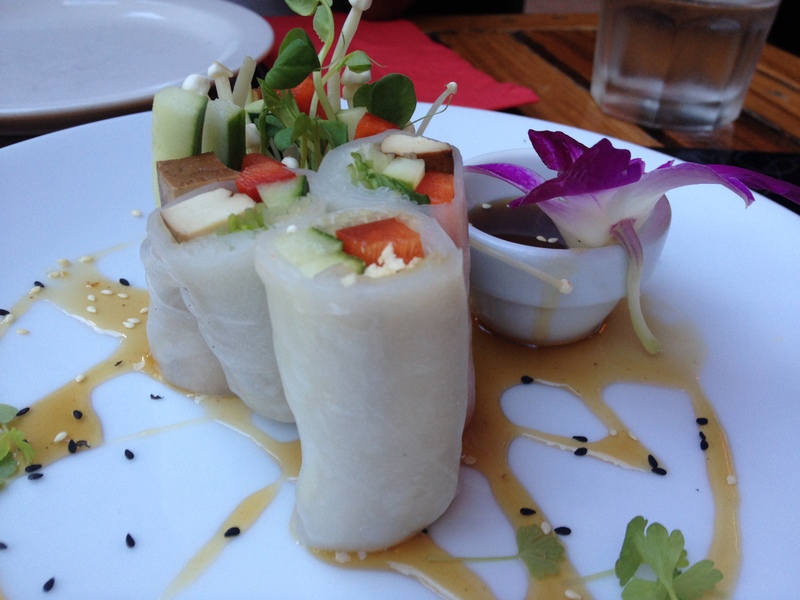 The spring rolls are presented just so beautifully, eating them feels like a crime. Actually. The spritz of sauce on the plate, the flower in the pot and the spring rolls standing in their glorious… gloriousness! 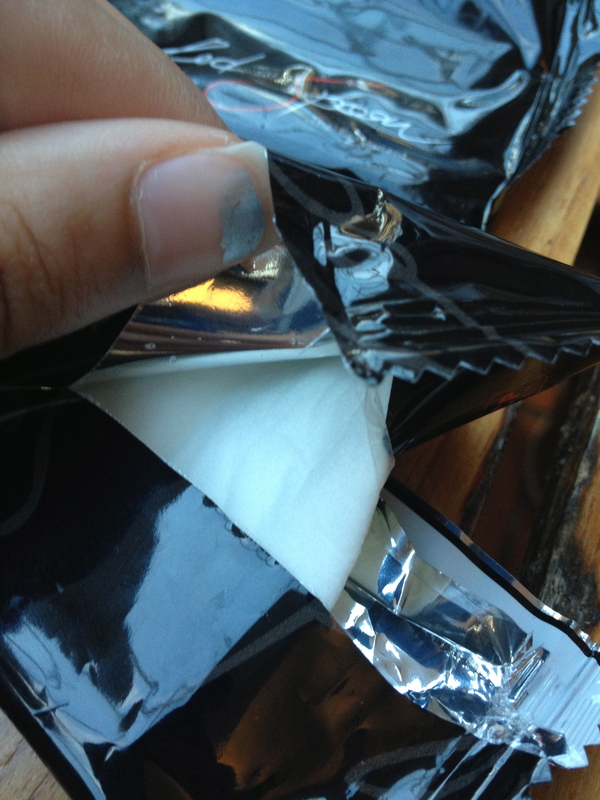 I loved the thin paper they used to make them more authentic, rice paper I believe, and it was chewy with a touch of sweetness. 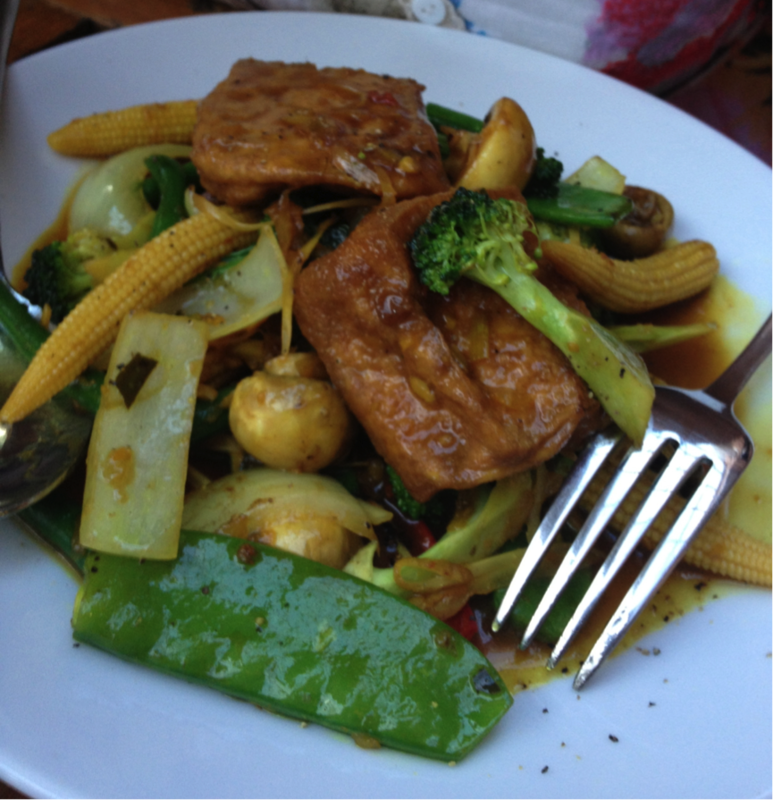 The inside was a delicious vegetable explosion with the additional of marinated tofu which went perfectly with the sauce! The curry puffs were a particular favourite of the evening. Warm, beckoning fried goods with a perfect crunchy but solid exterior, the inside was nice and warm mashed vegetables whose seasoning complimented the delicious sweet chilli sauce on the side! We had barely finished our last bite of entrée before we knew that our plates were whisked away and the mains had been set down before us. Honestly it was in the blink of an eye, their waiters are close to robotic! Mum was certainly very very happy! Daddy went for the Stir fried meal and got the Chilli Peppercorn sauce (though his face at the peppercorn sitting on top of his dish was pretty hilarious :P) with chicken. No pain in eating this Asian dish, daddy loved it to bits! 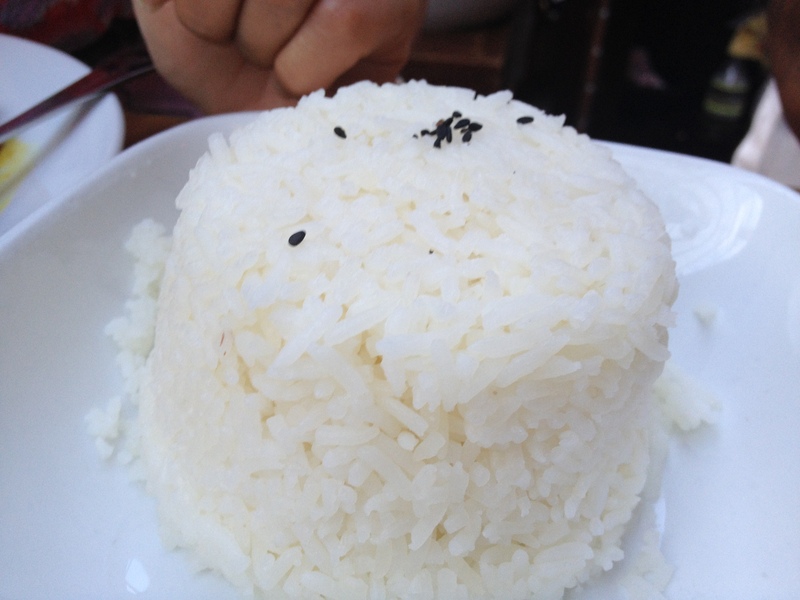 They ate it with a delicious, plump bowl of rice, so fluffy! Sorry back to my dish ;)! As you know, I got noodles with my preferred Chilli Basil flavoured noodles along with vegetables and tofu. This dish is self-explanatory in how utterly delectable it tasted. Honestly. Just look at it. I already noted how efficient everyone was but I think they might have been too efficient – I know, I know is there really such a thing at a restaurant? I loved the digital orders but the refilling waters at every attempt got a little disruptive. Also I appreciate the continuous dishes but when one has just finished their entrée, a 5 minute break is appreciated! Yum! I love Red Spoon!! 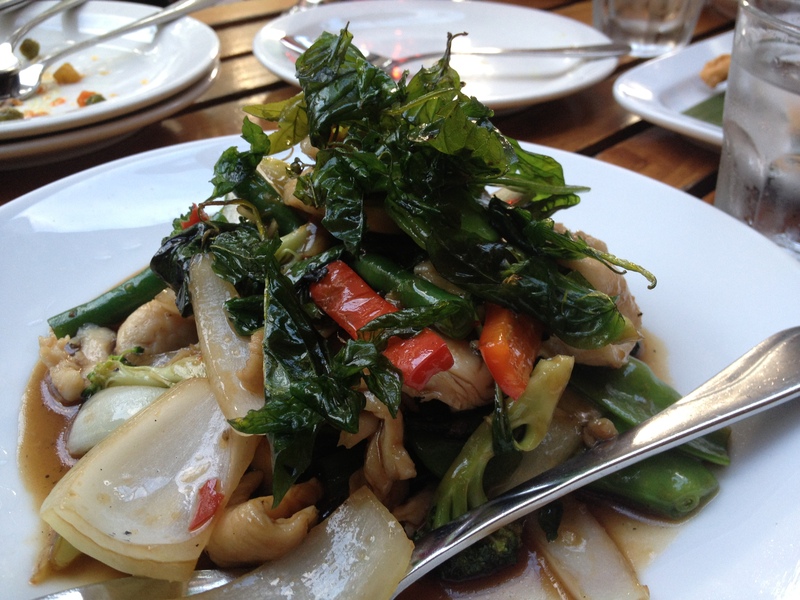 I had THE most amazing vegetable stir fry there I’ve ever had! (I think it was called ‘assorted vegetable stir fry’ or something on the menu). SO good. And I totally agree with you about their noodles! They are amazing! They make the best chicken cashew noodles ever (though reading this it seems like you are a vegetarian so you might not go for that one!!). This week “vegetables rice in Spanish paella” and the coming week ” traditional Valencia pumpkin fritters” going to lose? I love Thai food too, but I can never do with the famous Tom Yam Soup. Looks like a nice place to dine in………. I’ve heard great things about this place and your meal looks fantastic. As does your dessert, yumm! I really enjoy Thai food and the food at this restaurant looks amazing. great review! those drinks are so creative! I want the pudding! YUM! Oh that looks like such an amazing feast! I am a curry puff fiend! I also love noodles so I would have probably chosen something similar to your dish. looks like sucha yummy dinner. Yum yum yum, everything looks so good!! All delicious dishes, I would love to have a Fresh Coconut Juice. I heart Thai food, too! I think it’s all that coconut milk and curry and Thai basil…mmmmmm, altogether, a wonderful combination! Have a happy weekend, CC Uru! What a beautiful presentation of food! Yum! Glad you had such a wonderful dinner! I love thai food. So delicious! Great food post. Seriously got me hungry right now and I am about to sleep, too. Lol. Gosh!!!! all my fav dishes. Forget about the dessert but the rest are so tempting and delicious. Oh dear!! Now I want to go out and eat Thai today. The meal looks gorgeous!!! Such a lovely meal should never be rushed; rather, it should be eaten in slow, small bites to prolong the pleasure. Everything you described/pictured looks delectable, CCU. 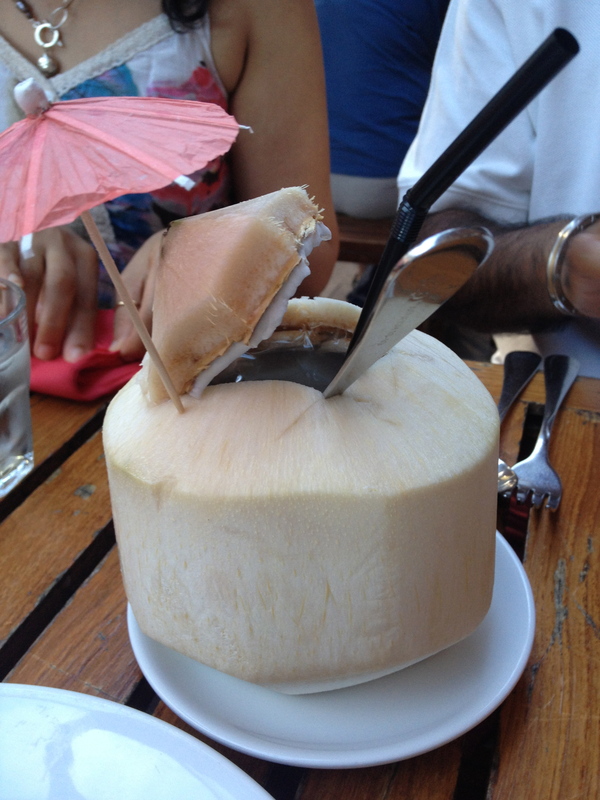 I’m quite lusting after that coconut as well…loooove fresh coconuts! 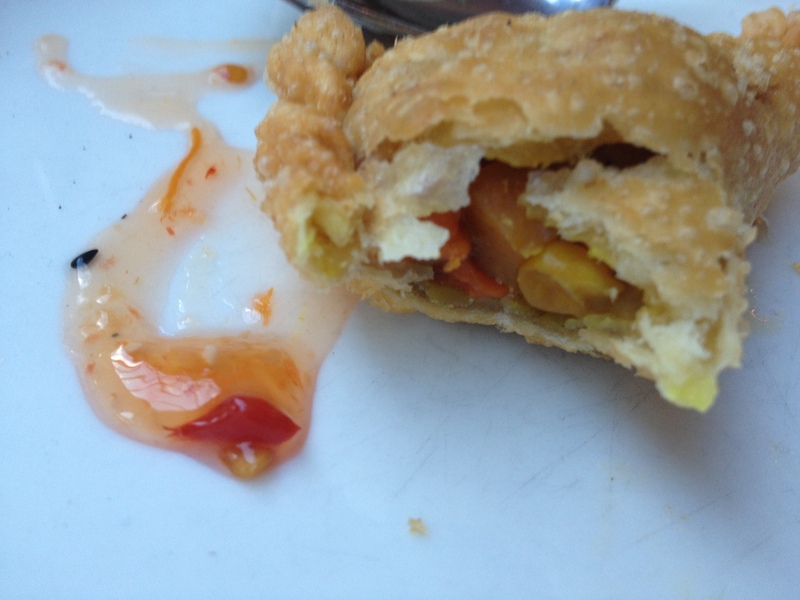 And those curry puffs…Mmmm is right! To be honest with you, I can eat thai food everyday. It’s one cuisine that I really want to be able to make it at home, super authentic, but with all the spices and proper cooking I really need to study a bit. It shouldn’t be too difficult because the dish comes out pretty fast after we order. It’s quite expensive in our area to eat Thai food, and since I want to eat it often, I think I need to learn to cook at home! 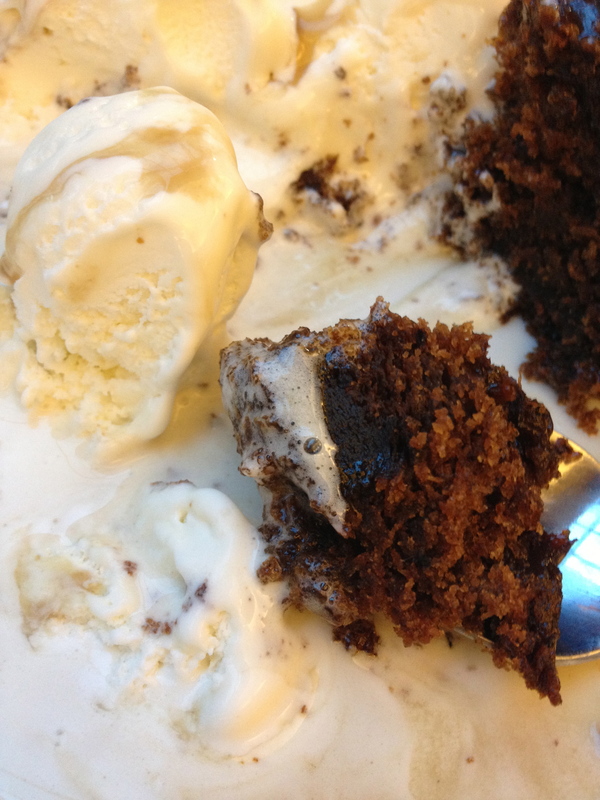 I’m so jealous of your meals…even desserts! I also think frequent re-fill of water can get a bit annoying and sometimes I don’t drink water too much when I find out. 😀 Well, perfect service can be pretty hard especially customers has different preference. 🙂 9.5 points is pretty good! I am soooooooo craving thai food right now! Everything looks so ridiculously good! Good Thai food can really be hard to find… So much of it is “Americanized” and thus over-sweetened, over-sauced, and over-sized! Getting a whole fresh coconut for the water is the sign of a clear winner though. I sure wish there was a comparable local option for me! Wish I had been there to share this meal with you! 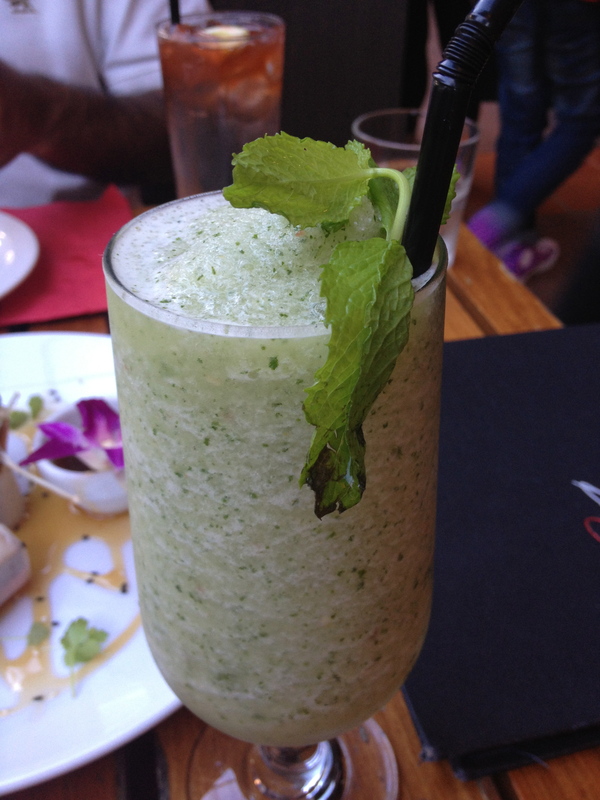 It looks wonderful and that minty coconut drink – YUM! I love Thai food–this all looks wonderful! Wow, what a fantastic meal! I have never seen anyone serve an actual coconut and it’s juice in a restaurant before, which is a shame because that’s my favorite kind of juice. 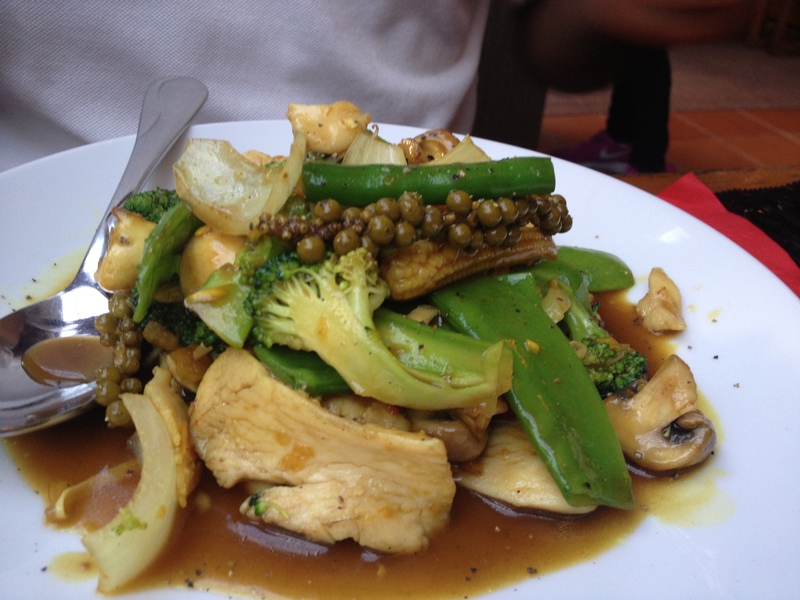 I love Thai food…there’s always so much to choose from! This looks like you had a sensational feast! 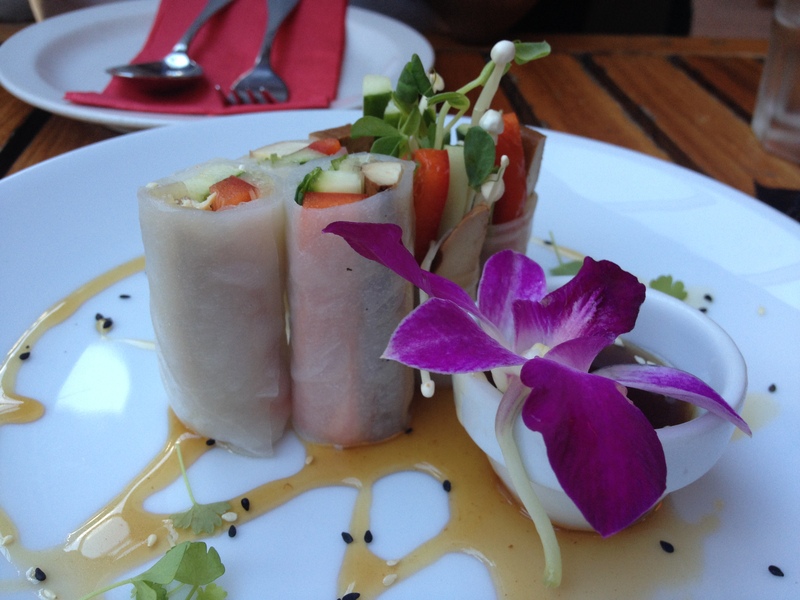 Those fresh spring rolls look amazing….I want some thai now too! I was missing your CCU Undercover posts anyway so no worries. 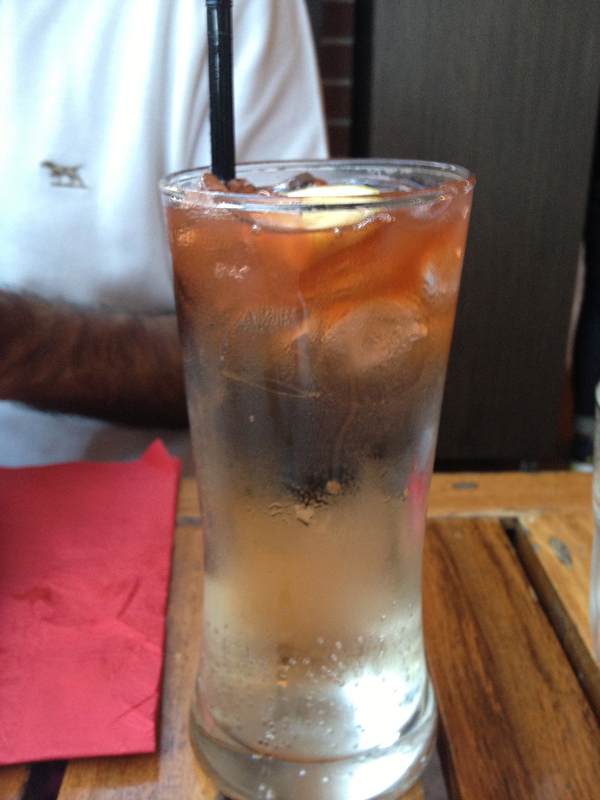 Love that coconut drink….looks refreshing. We have been craving Thai food around here lately. This food all looks amazing!!!!!! I especially covet the rice paper rolls and the sticky date pudding – two of my faves. All the food looks so good! I love Thai food so thanks for this review! I don’t normally go for vegetarian dishes but the chilli peppercorn tofu looks beautiful! Wow, what a great meal…love everything that was served…YUM! Everything looks insanely good! Those drinks too! Funny – at my favorite Chinese restaurant they are so attentive that every time you take a sip of tea they want to top off your cup. It is so annoying but I love the food. Never apologize. “Real life” gets in the way some times 🙂 I have finally let myself go beyond a week to post – it is wonderful! Wonderful meal you shared with your mom! Excellent work Super-sleuth! Looks delicious, especially dessert. From the delicious looking drinks to the fabulous dinner – it all looks so enticing. Those spring rolls look amazing as did the chicken with peppercorn sauce. Your reviews always make me hungry!! i would love to have gone undercover! and by undercover, i mean rather conspicuously consuming EVERYTHING. Lot of delicious food Uru. The entire dinner looks great, but I love the look of that fresh coconut juice. Wow!! Making me hungry – what a fabulous feast! Fantastic dinner … and the presentation – very classy. Big fan of Thai food and specially if it comes out like this – that Daiquiri looks good enough to drink too. Your photos are very good too – thanks for sharing this feast. These dishes all look delicious! Everything looks delicious. Love those spring rolls! I’ll be craving Thai for the rest of the day now. Mmm, thai food is my go-to choice for date nights with the bestie! I’m drooling over that peppercorn tofu dish. That meal looks amazing! I wish I lived where you do, just so I could eat it! 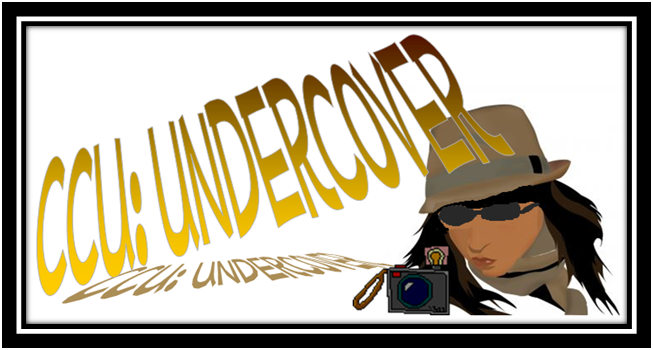 Another great undercover. 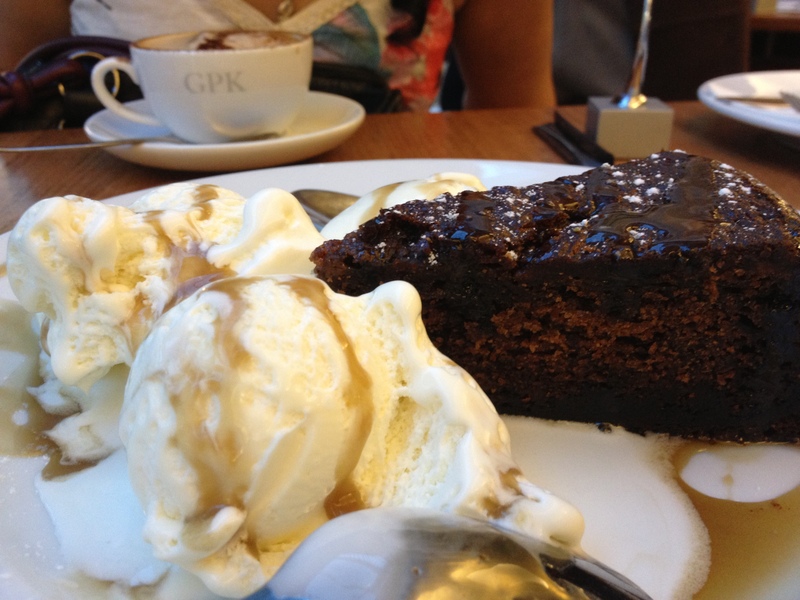 Terrific looking sticky pudding! Good stuff – thanks. Good thai food can be so hard to find, but when you do it’s the best! WHat a great meal! 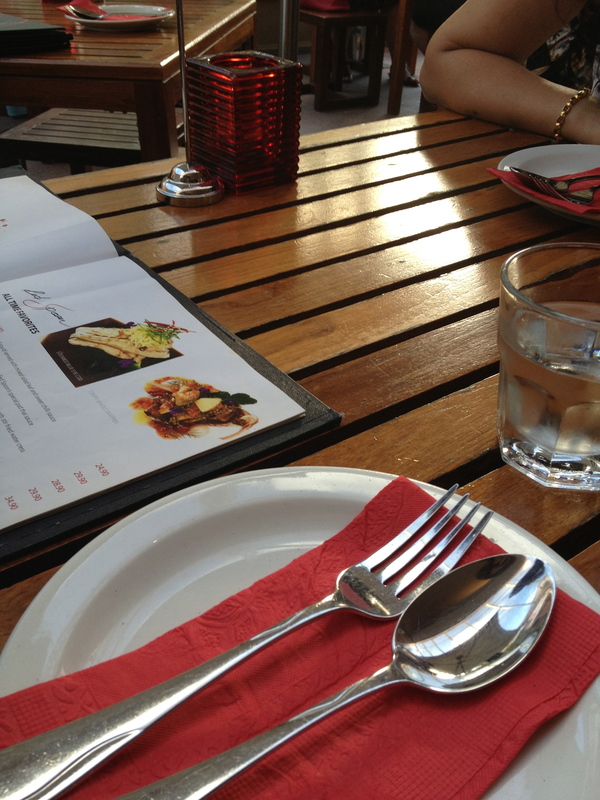 Australia is do expensive to eat out! I can’t believe the prices. Thai food is one of my favourites. So true in comparison to other countries! Everything looks delicious! I love the coconut juice served in its own shell. That’s authentic! Now you have me craving Thai food!! I love Thai food! Your dinner looks amazing and I would love every single dish. Uru, that looks like a completely AMAZING meal. And you got exactly what I would have ordered–love those fat noodles with all those yummy thai spices!! 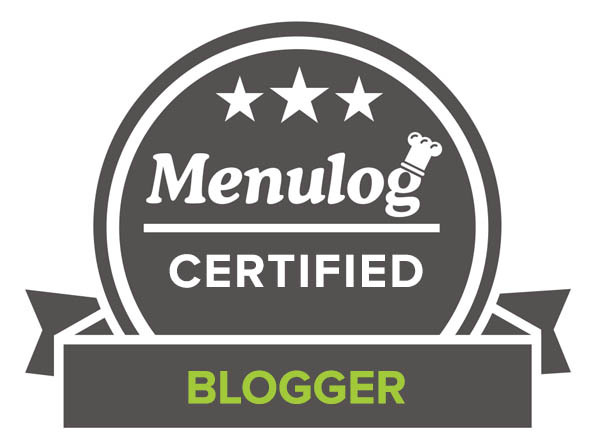 What an amazing experience – I was drooling over your starters, spring rolls are my favorite and I justs LOVE the braided crust around the puffs- um YUM! Fabulous recipes and gorgeous photography as usual! Yum, love Thai food. Looks so good that now I want some! Wow, I love Thai food but all of this looks exeptionally good! How lucky are you? Now I’m off to google lemon lime bitters..yum! Thanks for posting this wonderful assortment of Thai dishes. A little early in the morning but very inspirational. 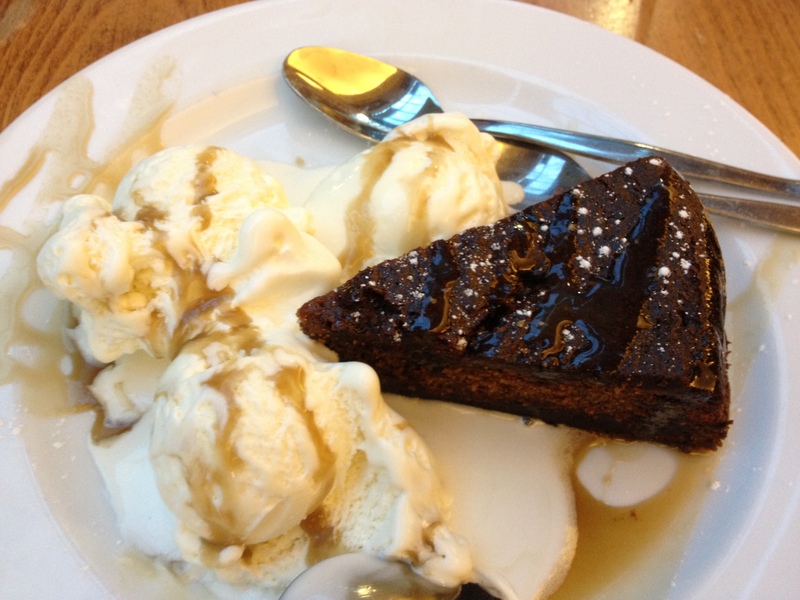 And that sticky date pudding dish … amazing. I understand you went elsewhere to have it though … not to the same restaurant. I’ve never tried it, though I’d like to. 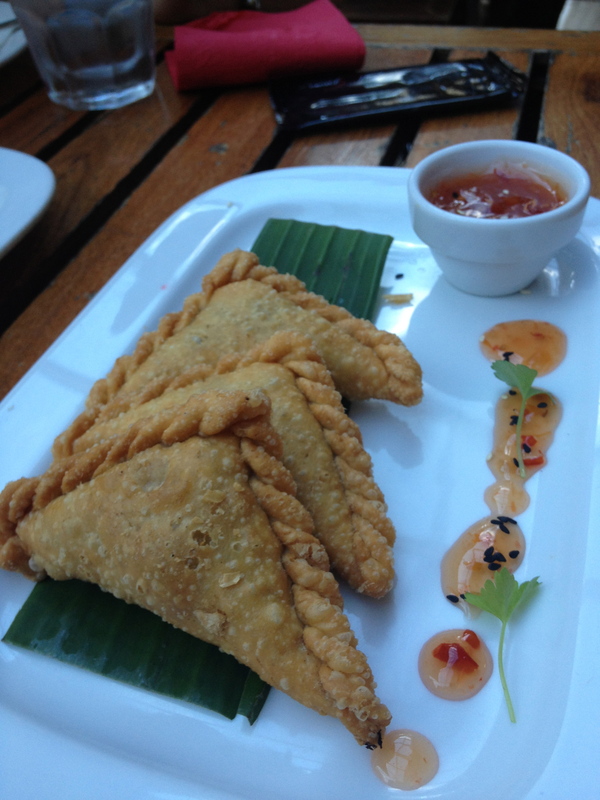 The curry puffs are one Thai dish that I’ve never had in a restaurant or at home. And when ordering at one of the 2 Thai restaurants I frequent, I usually stick to sate skewers (chicken or beef), summer rolls, pad thai or sometimes another noodle dish. I enjoy seeing the vegetarian dishes that you order as they’re not something I have ever considered ordering out though I may try to make one of them the next time I feel like cooking Thai food. Darn, I just realized that I never posted the spicy fish ball and shrimp thai inspired soup with coconut milk and lemon grass that I made a while back and wanted to share. I’ll have to remedy that omission. Haha I look forward to your thai inspired dishes my friend and hope to keep posting as much as school will let me! I am now craving Pad Thai and Sticky Pudding! You lucky girl!!! It all looks fantastic but the Chili Basil Noodle looks the best to me! YUM! Looks like you had a wonderful time, and so many choices. I would like one of those Spring Rolls, right now! My stomach literally growl while reading the post….I miss fresh coconut juice. Mmm, the food looks delicious! I am sure you had a great time! yummm! love thai food! what an awesome night of dinner!